Willows are deciduous trees and shrubs which belongs to the family Salicaceae. Willow has wide application in medicine. Compound isolated from the bark, called "salicin" is used in the production of very popular and widely used drug: aspirin. This is just one of numerous beneficial compounds that can be found in the willow. There are around 400 species of willows worldwide. People chewed bark of the willow tree to treat fever, inflammation and pain in the past. They are found primarily on moist soils in cold and temperate regions of the Northern Hemisphere. Willow tree is used in the manufacture of baskets, fishing nets, furniture and toys. Some willows (particularly arctic and alpine species) are low-growing or creeping shrubs; for example, the dwarf willow (Salix herbacea) rarely exceeds 6 centimeters (2.4 inches) in height, though it spreads widely across the ground. It is one of the smallest woody plants in the world. Dyes extracted from the willow trees are used for tanning of the leather. The white willow is the largest species of willow trees and grows to 30 meters (100 feet) tall. Compared to other wooden plants, willow has short life span. It can survive up to 30 years in the wild. Most willows are very short-lived. A 70 year old willow is a very old tree. Few live to be more than 100 years old. The bark is generally grey, brown or dark and very scaly. Due to ability to absorb large quantities of water, willow is often planted in flooded areas or areas that need to be drained. Strong, deep and wide root also prevents erosion of the soil. Willow leaves are generally 5 to 15 centimeters (2 to 6 inches) long, deciduous, alternate, and commonly elongated and serrated or smooth. Willow is one of the fastest growing plants in the world. It can grow 10 feet in height each year. The male and female flowers are quite different from one another in appearance and, side by side, it would be easy to assume that a male and a female willow tree were two different species. Besides from the seed, willow can easily reproduce from broken twigs and leaves. Flowering takes place at the beginning of the spring. Flowers are rich in nectar which attracts insects and ensures pollination. Fruit of willow is brown capsule. The fruit is a small capsule containing numerous tiny (0.1 mm) seeds embedded in white down, which assists wind dispersal of the seeds. The seeds must land in a moist location and germinate quickly or they dry out and soon die. Willow is dioecious plant which means that each plant produces either male or female reproductive organs. Flowers are small and organized in catkins. Willow trees are able to reproduce without any type of fertilization taking place. They are able to create genetic copies of the parent plant when fallen branches take root near water sources. Willow trees are notably adept at vegetative reproduction with the ability to sprout from branches, even upside-down. Willows are very cross-fertile and numerous hybrids are known, both naturally occurring and in cultivation. The weeping willow (Salix babylonica) tree is the most commonly known willow tree. Willow has extremely strong and well developed root. It is often larger than the stem. Root of willow can clog the drains, sewage and septic systems and destroy sidewalks in urban areas. Color of the leaves changes seasonally. Leaves turn from green to yellow in the autumn. Willow is deciduous plant, which means that it sheds its leaves each winter. Willows produce a modest amount of nectar from which bees can make honey, and are especially valued as a source of early pollen for bees. Basic crafts, such as baskets, fish traps, wattle fences and wattle and daub house walls, were often woven from osiers or withies (rod-like willow shoots, often grown in coppices). 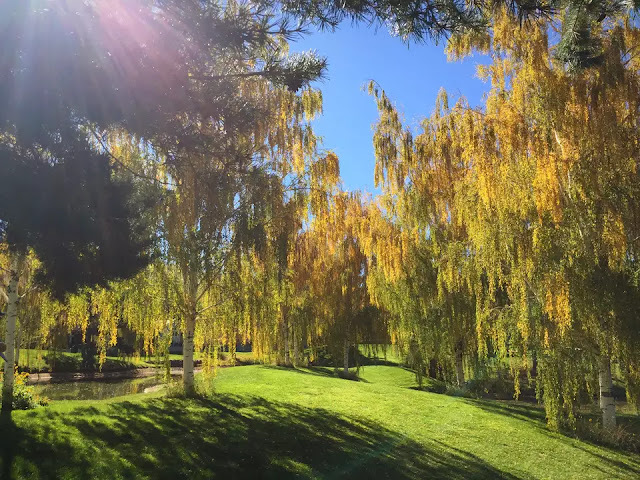 Willow trees have elongated leaves that are green on the upper side and whitish on the bottom side. Willow wood is used in the manufacture of of boxes, brooms, cricket bats, cradle boards, chairs and other furniture, dolls, flutes, poles, sweat lodges, toys, turnery, tool handles, veneer, wands and whistles. Willow is used to make charcoal (for drawing). Willow is used to make living sculptures. Living sculptures are created from live willow rods planted in the ground and woven into shapes such as domes and tunnels. Willow stems are used to weave three-dimensional sculptures, such as animals and figures. Raindrops that are falling to the ground from the drooping branches of willow resemble tears. That is how weeping willow got its name. In Assyria, Sumer and Egypt these trees were attributed with healing due to the salicylic acid found within the bark, a raw form of today’s aspirin. In Ancient Greece the physician Hippocrates wrote about its medicinal properties in the fifth century BC. Native Americans across the Americas relied on it as a staple of their medical treatments. In 1763, its medicinal properties were observed by the Reverend Edward Stone in England. He notified the Royal Society, which published his findings. The active extract of the bark, called salicin, was isolated to its crystalline form in 1828 by Henri Leroux, a French pharmacist, and Raffaele Piria, an Italian chemist, who then succeeded in separating out the compound in its pure state. In 1897, Felix Hoffmann created a synthetically altered version of salicin (in his case derived from the Spiraea plant), which caused less digestive upset than pure salicylic acid. The new drug, formally acetylsalicylic acid, was named Aspirin by Hoffmann’s employer Bayer AG. Rare types of willow can grow to the height of 70 feet. Most willows can reach 35 to 50 feet in height and develop the crown of the same size. Willow is one of the “Four Species” used ritually during the Jewish holiday of Sukkot. In Buddhism, a willow branch is one of the chief attributes of Kwan Yin, the bodhisattva of compassion. Christian churches in northwestern Europe and Ukraine often used willow branches in place of palms in the ceremonies on Palm Sunday. Old Man Willow in J. R. R. Tolkien’s legendarium, appearing in The Lord of the Rings. “Green Willow” is a Japanese ghost story in which a young samurai falls in love with a woman called Green Willow who has a close spiritual connection with a willow tree. The “Whomping Willow” is a feature of the grounds of Hogwarts School for Witchcraft and Wizardry in the Harry Potter stories.